The film tells the story of three people who were imprisoned as children in Terezin, the small Czech town that the Nazis converted into a concentration camp for Jews. The filmmaker, who herself spent two years in Terezin, traces the survivors’ war experiences, with the help of their personal journals and drawings. She follows their stories through the difficult postwar years into the present, filming the survivors with their families in the three different countries in which they settled, the United States, Austria and the Czech Republic. In the film, parents and children question the need to talk about the past and they explore the effect of the Holocaust on their lives. 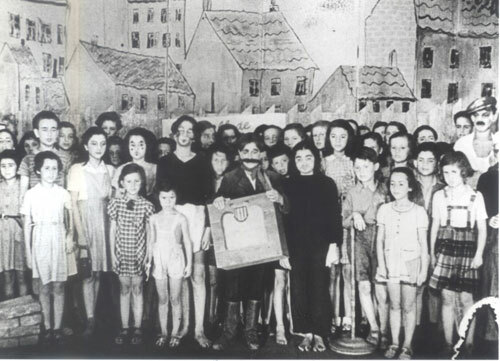 The daughter of one survivor confronts her father for the first time, saying, “You cannot pretend it did not affect us.” In their efforts to use Terezin for propaganda purposes, the Nazis permitted inmates to stage a children’s opera called “Brundibar”. The survivors attend a performance of Brundibar in Prague and recall the special significance it had fifty years ago. Today the opera symbolizes the lost world of the Terezin children. 16mm – color – 80 min. video – color – 80min. video – color – 60 min. VOICES of the CHILDREN by Zuzana Justman is licensed under a Creative Commons Attribution-Noncommercial-Share Alike 3.0 United States License.